Some of the most noticed features of mice are their small pointed noses, their whiskers, their small black eyes, their round ears and their long scaly tails. Mice weigh about one ounce (twenty-eight grams). Their heads and bodies are three to four inches long not including their tails. A mouse's tail is almost as long as its body. They have five toes on each of their four feet and each toe has a sharp claw. Their claws help them grip onto things when they climb. Mice have two kinds of teeth. They have incisors which are their front teeth and cheeks which are their back teeth. Incisors are the teeth with sharp edges used to gnaw on things. Cheeks are flat teeth which are used for eating. Mice are herbivores. They keep the weed and plant population down. This is great service to humans and other animals. Mice help people a lot. Some scientists study mice. Other people keep mice as pets but not house mice or field mice. Pet mice are very easy to care for and they do not need much attention. They are very playful and active. They will run and jump all over their cages. If you have more than one mouse they will probably groom each other. Some mice will eat out of their owner's hands if they are trained properly. They can also be trained to sit on their owner's shoulder. 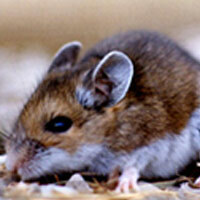 Mice mate up to seventeen times each year. A female mouse can become pregnant in forty-eight hours. A mother mouse has four to nine baby mice in each litter. Young mice are called kittens. When they are born they have no hair and most of them are pink but some come in darker colors. It takes thirty-five days for a mouse to mature. The Norway rat (Rattus norvegicus, also called the brown rat or sewer rat) is a destructive pest found in urban and suburban neighborhoods. These rodents eat and contaminate food, damage buildings and other property by their gnawing and burrowing, and may spread diseases that affect people and pets. Norway rats are husky, brownish rodents that weigh about 11 ounces. They are about 13 to 18 inches long including the 6 to 8 1/2 inch tail. Their fur is coarse and mostly brown with scattered black on the upper surfaces. The underside is typically grey to yellowish-white. Rats have litters of 6 to 12 young, which are born 21 to 23 days after mating. Young rats reach reproductive maturity in about three months. Breeding is most active in spring and fall. The average female has four to six litters per year. Rats can live for up to 18 months, but most die before they are one year old. The presence of rats can be detected by droppings or evidence of fresh gnawing. Tracks can be seen in mud and on dusty surfaces. Runways and burrows may be found next to buildings, along fences or railroad tracks, and under low vegetation and debris. Historically, they are associated with having spread the plague or black death during the Middle Ages. The roof rat is also known as the black rat, even though it is not necessarily black in color, but rather is usually dark brown. Your typical roof rat is between 13 to 18 inches long, including its tail. In fact, it is distinguished from other rats by that tail, which is longer than the rest of its body. Roof rats are sleek, slender, and agile. Their have large ears. Roof rats are largely commensals and live in close association with man. They seldom become established as feral animals as do the Norway rats; however, in Lavaca County they have been found throughout the county, in the towns, and on the farms. They inhabited grocery and drug stores, warehouses, feed stores, and poultry houses and were very common in cotton gins and associated grain warehouses. On the farms they lived in barns and corncribs. They may live near the ground, but usually they frequent the attics, rafters, and crossbeams of the buildings. They make typical runways along pipes, beams or wires, up and down the studding, or along the horizontal ceiling joists, often leaving a dark-colored layer of grease and dirt to mark their travel ways. Like the Norway rat, the roof rat is largely nocturnal and only where populations are relatively high does one see them frequently in the daytime. There is some indication that the larger and more aggressive Norway rat is supplanting the roof rat in many parts of the United States. In the southern United States, however, the roof rat is by far the more common of the two. Roof rats breed throughout the year, with two peaks of production - in February and March and again in May and June. The period of least activity is in July and August. The gestation period is approximately 21 days, and the number of young per litter averages almost seven. The young rats at birth are naked, blind, and nearly helpless. They mature rather rapidly, are weaned when about 3 weeks old, and are able to reproduce when approximately 3 months old. In Texas, young females with a head and body length of 125 mm were sexually mature. Like the Norway rat, the roof rat is destructive to property and foodstuffs. Also, it plays an important part in the transmission of such human diseases as endemic typhus, ratbite fever, and bubonic plague.